A former Welsh Guard has traded protecting royal palaces for constructing homes, after joining a house builder in Plymouth. 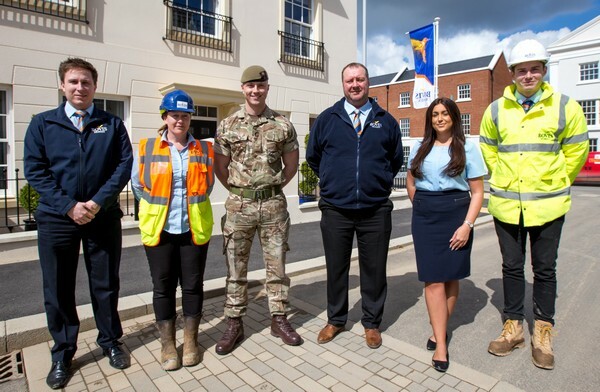 Josh Beesley, 24, who guarded St James's Palace in London and performed in the Trooping of the Colour, has been recruited by Bovis Homes as a trainee site manager. Josh, who received an honourable discharge from Wales's Senior Infantry Regiment, is now shadowing the team at Sherford as he prepares to start his formal employment later this year. Now living in Cranbrook near Exeter, Josh said: “Being part of the army is such a high-intensity role, and while it is different working on a housing site, there are similarities. It's great working as a team and both are all about team work. “I would 100 per cent encourage others in the military to join Bovis Homes and I've told a few of my mates about them. They warn you in the army that the grass isn't always greener on the other side when you leave – but in this case, it definitely is. The company received the prestigious Silver Award from the Ministry of Defence Employee Recognition Scheme (ERS) last year for supporting the employment of military people. It is also a signatory of the Armed Forces Covenant, a promise to ensure that those who serve or who have served in the armed forces, and their families, are treated fairly. Josh has been meeting Bovis Homes residents, sales staff and the site team, and learning about health and safety, as he gears up for his official first day in September. He recently visited the Sherford site in his Welsh Guard uniform, which includes a leek badge on the beret, to garner support for Help for Heroes. Bovis Homes is a supporter of the charity, which provides lifelong support to military personnel and veterans with injuries, illnesses and wounds sustained while serving. His dad Stuart is project manager at Sherford and said Josh, who was in the Welsh Guards for three-and-a-half years, was already impressing. As part of its continuing commitment to supporting the military, Bovis Homes aims to raise a thousand pounds for charity SSAFA as part of national Armed Forces Week, which ends on 30th June. Meanwhile, on the home selling front, the house builder offers a unique 'Trinity' discount scheme for service personnel, which combines buyer assistance schemes with a package of offers, in order to purchase their own Bovis Home as simply and affordably as possible.